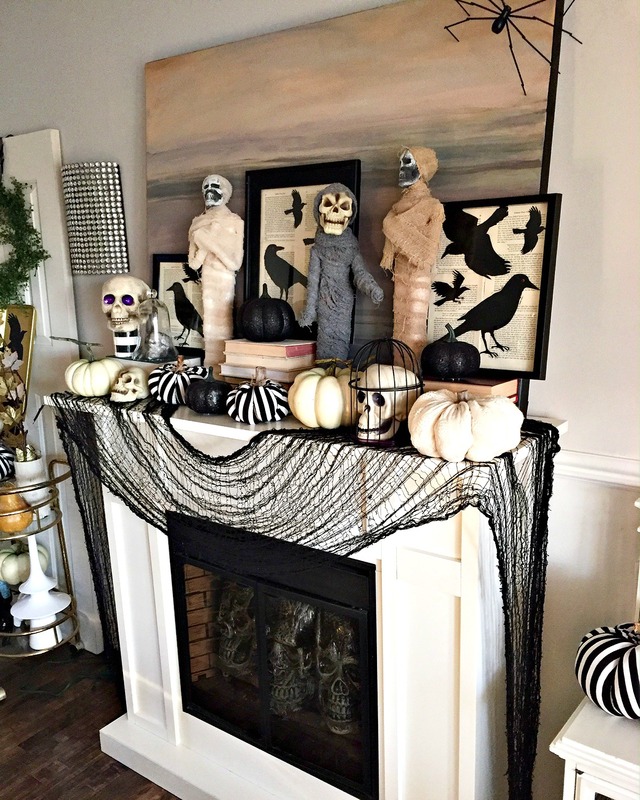 Halloween is around the corner, and I’m so excited about this fun and slightly creepy Halloween mantel that the kids and I put together in about 20 minutes. The only items I bought for this mantel were two of the mummys. 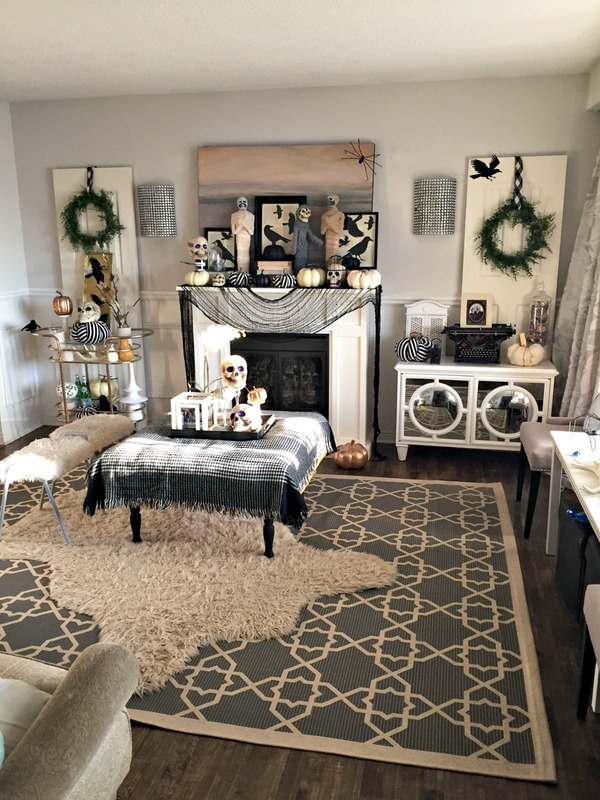 Yep… My name is Sue and I’m a holiday decoration hoarder. Lol…. But seriously, are those mummys not the coolest? They are from the Dollar Store, and the middle one was one I created a couple years ago using an old doll, a skull and some grey gauze. When I saw these other mummys at the dollar store, I snapped them up and knew they would make the perfect trio. 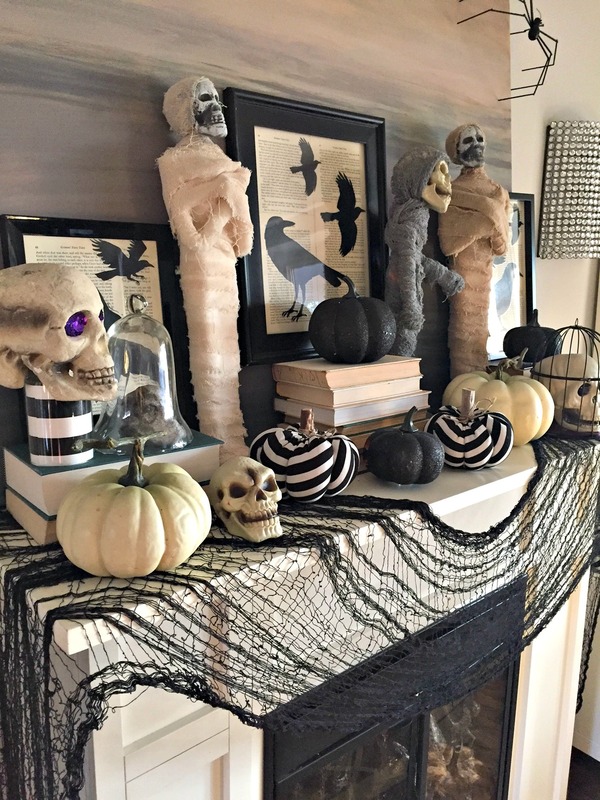 It was easy to transition from Fall décor to Halloween décor, since these black & white and cream sweater pumpkins work so well together for both holidays. I used some old frames I had lying around and tore out some old book pages to use as a background. Next I put these fun Raven decals on the book pages and stuck them behind the black frames. I love the huge impact that these create and they are my favourite thing on the mantel. 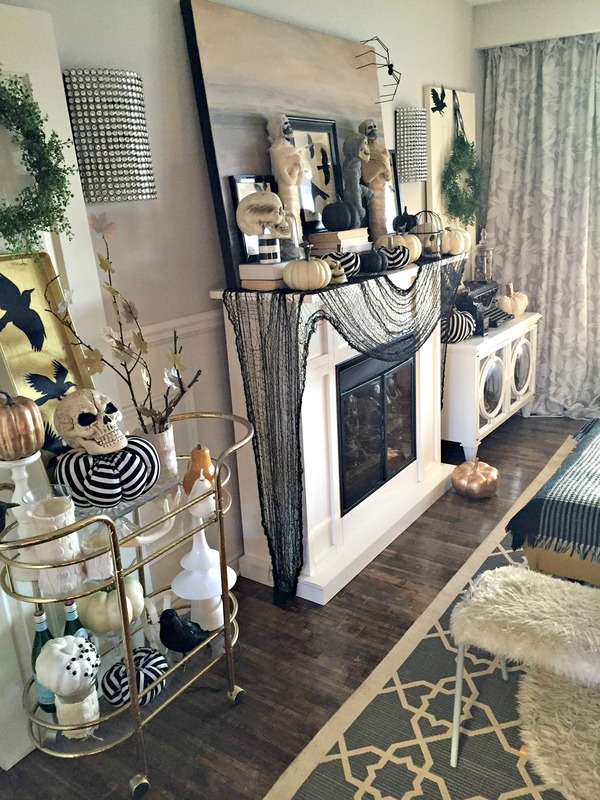 I covered my ottoman with a black and white houndstooth patterned blanket, and carried the skull theme throughout the room by adding them on the ottoman tray and barcart. The skulls are so creepy because they look like they are kind of smiling. 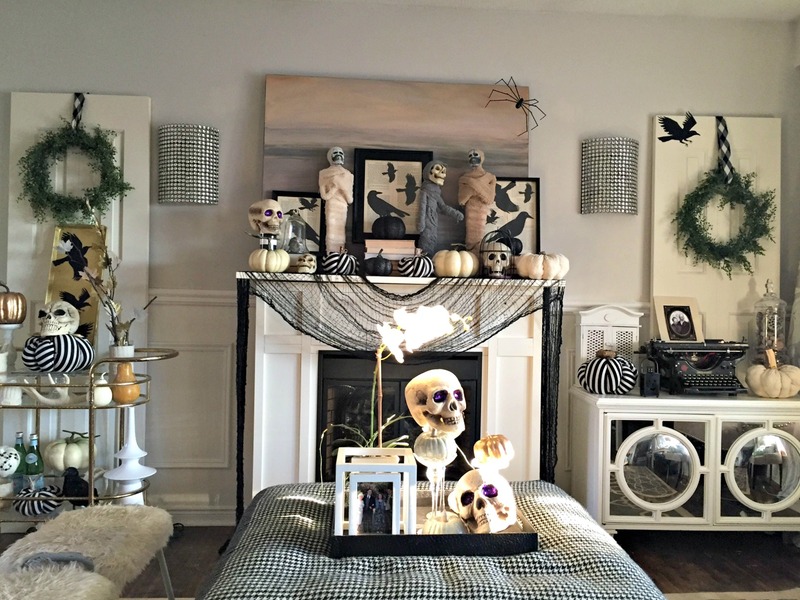 I have some grand plans to create some built in shelves on each side of this fireplace, but for now I’m having fun decorating just the mantel for each changing season. 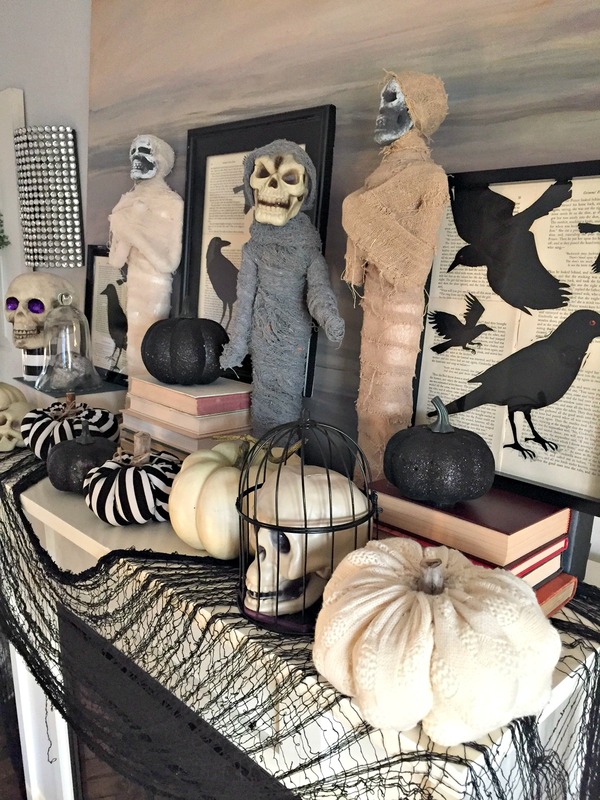 Thank you so much for checking out my creepy Halloween mantel and I’ve got my fingers crossed that I might be able to finish the built in shelves in the next couple of months, so that I can do another mantel feature for Christmas!! !